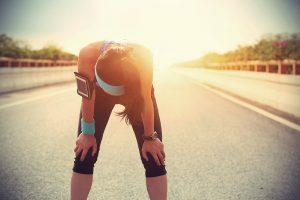 Should I Worry About Pain When Running After My Injury Heals? Let’s face it most doctors would say pain is abnormal and unacceptable. But what about when you run? What about during your mile repeats, hill repeats or long runs. I don’t know about you, but I feel like I have pain during every one of my hard workouts, especially if I’m doing them correctly. One of the biggest limiters in terms of regulating your activity when you have been injured is pain. So the big key with returning to running is learning how to recognize and manage that limitation. Pain is a fact of life for athletes. You have to recognize that after a race you are going to have pain when you start running. You’re going to have of varying levels of pain whenever your fitness level is low. You are almost never going to have a pain level of zero with your initial runs after a period of recovery. That’s true after a long period of rest following an Ironman, it’s usually true after a period of rest during the off-season and it’s especially true after a long period of rest following a period of forced rest after an overtraining injury. The big confusion comes in you have had an overt injury like a metatarsal stress fracture or some other type of overuse training injury. After you have treated the injury, whether that is treatment with immobilization in a fracture walking boot, or you treated the injury with crutches or you treated it with not running or you treated it with only cycling and swimming instead of running. Whatever treatment you been doing you have modified your activity and reduced your running significantly to try to get that injury to heal. When doctors say, “Use pain as your guide” or we say but we don’t want you to have pain, what we really mean is that we don’t want you to have the same pain in the same way. Now, lots of people have pain after injuries. That’s completely normal. It’s more about figuring out which pain is acceptable and which pain is an indicator that you’re about to worsen your injury again and undo the healing. There’s a very big difference between those two types of pain and it is something that you can figure out. Lots of people have pain after injuries. It should be expected that at some point during your recovery you are going to have pain. For example after I had a reconstructive knee surgery, the most painful part of the entire surgical recovery process was at about 6 weeks. My knee was completely stiff and it wouldn’t bend at all. I went to physical therapy and they decided to mobilize my knee because it was completely locked up and rigid because my knee had developed lots of scar tissue. The physical therapist had to forcibly move my stiff knee to break up all the scar tissue that was locking it up. It didn’t want to move. That day was by far the most painful part of the entire surgery. It was even more painful been waking up in the hospital after surgery. But that pain was expected. It was “normal.” The physical therapist said, “Okay, get ready. This is going to hurt.” And she was right. It sure did. So when you’re recovering after an over training injury like a stress fracture you have to expect that you’re going to have pain. There’s going to be pain through the process. But you have to make sure that you can monitor the pain to and make sure that whatever you’re doing is not going to cause you further harm. There seems to be a myth that you have to wait until you’re 100% pain-free until you start exercising. There is also this widespread misconception that if you won’t have any pain or discomfort at all when you resume your activity and get back to running. That may be true if you wait until you’re completely healed. But you have to realize that completely healing an overtraining injury like a metatarsal stress fracture takes a very long time. Complete healing means that the fracture has completed the inflammatory phase of healing, the proliferative phase of healing and the remodeling phase. What you may not realize it, but the remodeling phase of healing can go on for a year to 18 months. No doctor is going to tell you that you have to sit on the couch and wait an entire year before it’s safe to run on a metatarsal stress fracture. One of the first concerns that patient expressed to me after they start running is that they have these weird random occurrences of pain. Maybe it’s a sharp pain that they only feel for a second. Maybe it’s throbbing pain that they only feel occasionally. Maybe it’s a soreness that they feel when they only step on their foot a certain direction a couple of times a day. All of these different random pains starting make you worry that you’re going to break something again. You start to freak out and worry that you haven’t completely healed. That make total sense. You start to picture yourself in the doctor’s office being told that you have to put your foot back in the fracture walking boot and start walking on crutches again. So it’s no surprise that any intermittent painful sensation in your foot when you’re running would cause anxiety. You can get these random sort of occurrences of pain for lots of different reasons after you have had a metatarsal stress fracture that still in the process of healing. For example, going back to my knee surgery, even after I was basically recovered and cleared for activity, I would get pain. I would be driving my car or sitting at my desk at work and I’ll get the sudden sharp jolts of pain in my knee. Sometimes they were right over my kneecap. Sometimes the pain was on the outside of the knee. But much of that pain was really just from nerves growing back and soft tissue remodeling. It’s part of the healing process with the scar tissue being replaced by healthy tissue. But none of these painful episodes lasted for very long. I would get this weird pain. The pain didn’t hang around it would almost immediately dissipate. It was never pain that would last for days. It would just be some momentary weird ache or sharp pain. But to be clear as soon as I would have any pain at all it would cause worry. You can get these little random episodes of pain as the nerves regenerate. You can get pain as a soft tissue is changing. You can get pain as the scar is remodeling. You can get pain as bone healing is happening. And you can certainly get pain as all of the scar tissue surrounding the injured structure starts to break up when you start to move it. These weird random pains don’t concern me at all. Particularly when they’re not in the same spot. If these little episodes of pain crop up in different locations intermittently I wouldn’t be very concerned that they’re actually related to the primary injury itself. I just think of it as part of the recovery process. So let’s imagine that you’ve had a metatarsal stress fracture. It’s been healing. You’ve gone through the process of immobilizing the fracture in your fracture walking boot, or you were wearing stiffer shoes for a period of time. Maybe you were even on crutches. Of course, you probably stopped running as well. Whatever the treatment it seems to have healed. Even if the tenderness or sharp episodes of pain may be in the same spot if they’re intermittent and unrelated to activity it’s unlikely that they would be an indicator of ongoing damage or worsening of the injury. What we’re concerned about when you’re returning to activity and you’re getting back to running it is further damage. If you go out and run and you can run a mile and you’re vaguely sore because you haven’t been running for a month or two I would think that’s normal. That doesn’t really surprise me. When I had surgery I didn’t run at all for a few weeks. So when I first ran, everything was sore. No surprise I hadn’t run for weeks. So feeling some discomfort soreness with that initial run is expected. It’s probably not really a big deal. So it’s not even necessarily localized achiness or soreness after a run that’s most worrisome. Soreness itself is not a big deal. It’s really about how long that soreness hangs out and what happens. So in evaluating that pain, the thin g to consider is that if you go for a run and you’ve had a stress fracture and it kind of aches a little bit here and there while you run it doesn’t really worry me. n describe these little internal instantaneous pinching sensations. And you don’t know what to make of them. But to me those sharp little fleeting sensations are typically representative of nerve pain. I think they often happen when the nerve are regenerating. Those are usually happening when you’re sitting still. If you have the sort of momentary intermittent sharp pains when you’re walking or running that maybe scar tissue breaking up. You just have to make sure that it’s not an ongoing injury or worsening of your stress fracture. And there is a way to figure that out. The stuff that is worrisome to me is if you’re ramping up your mileage and you go from one mile to 2 miles to 3 miles or whatever, and you’re running in decent shoes. You’re trying to run with good form, even though you can’t really run with great form when you haven’t been running much, you’re still trying to pay attention to it. You’re running on a reasonably flat ground. You’re not running on uneven trails where you’re pronating and supinating all over the place. You’re going for reasonable runs. The worst thing is that every time your foot hits the ground, with every single foot-strike, Every time the foot lands it hurts in the same spot. If it hurts and your throbbing pain in that same area that you’re having pain when he developed a stress fracture that is worrisome. You should not continue to ramp up your mileage if that’s happening. That’s a definite! If you have bruising or swelling that you clearly see correlating with those painful episodes, ignoring it is clearly a bad idea. You need to stop whatever you’re doing and reevaluate. However if you are ramping up your activity and those weird achy sort of pains don’t seem to increase in frequency, they don’t seem to increase in intensity, then I would actually have very little worry or concern that the stress fracture would recur or happen again. It’s really just an issue of trying to determine is this a pain to worry about or not. The pains that any recently injured runner should worry about are throbbing pain or soreness every single step, every time you land when you run. Throbbing pain after you have gone for a run is concerning. If you go for a run and you get home and you’re having throbbing pain or aching in the foot while you’re just sitting around that is cause for concern. Or if you wake up the very next morning after your run and you have lots of pain while you’re still in bed and right when you get up and start walking on it, and that pain persists as you’re walking on it after you wake up, those things are all very worrisome to me. However if the day after you run you wake up and think, “I don’t know I guess I have some general soreness because I haven’t been running very much.” If you have the usual sort of soreness that would be expected after you haven’t been exercising and you’ve lost your fitness, like when you go for a run and you’re out of shape, all of that’s normal. If you have a little bit of those random sharp pains off and on, even while you’re just sitting at your desk but not really seeming to correlate with when you’re walking or when you’re active, that’s kind of normal. But as long as the pain isn’t really increasing in frequency or intensity, I wouldn’t really get worried about it too much. What you have to realize is that you can’t panic just if you have a little bit of pain. Let’s hypothetically say that you have a 1 out of 10 pain level when you’re running. The pain isn’t with every step. Let’s say the pain is intermittent. You have this very small amount of pain off and on throughout your entire run. But you also seem to have a 1 out of 10 pain level intermittently throughout the day. Again, it’s inconsistent and doesn’t seem to correlate directly with activity. 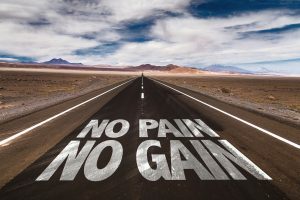 If you’ve been paying attention to the pain and you are sure of the pain level, you can put a number on it, when it is happening…then you have a great baseline to use for comparison and you alter your activity level. If you don’t have any of the worrisome kind of pain that I mentioned, than one simple approach is to monitor your pain level and start ramping up your activity and see what happens. The easiest way to evaluate whether or not you’re safe to progress any further and continue to assess whether or not you’re really at any risk of doing damage to your foot is to keep a pain journal. Many runners think to keep it a pain journal seems kind of tedious and perhaps even ridiculous but it can be really valuable. An easy way to do it is to take your training log and add a column for pain. Maybe add a second column to note the location of the pain. You could also add a third column for a description of your pain. It just depends upon how much information you want. Some people really want to keep track of everything. The more information the more useful It is. For example if you say you went for a 2 mile run on Tuesday and then you woke up on Wednesday morning. You notice that you had no pain when you woke up. When you got out of bed and started walking you had sharp pain that lasted for just a few seconds. But then the pain was gone. You didn’t really have any other pain the rest of the morning. So now you know how much pain you had, how long the pain lasted and where the pain was located. As long as you have a baseline and you know how much pain you have before you really started returning to activity and you have a way to gauge whether or not the injury could be getting worse. If you had a week or more of a consistent, low pain level, especially pain that is short-lived or intermittent and it may be safe to start ramping up activity. If you have had sufficient healing, you run every other day and you start out with short distances at a moderate pace, you should have a very low risk of re-injury. So if you have always had a 1 out of 10 pain level, and you’re sure of that, give me a makes sense to start ramping up the activity level and see what happens. If you run 1 mile every other day, and you have no bruising or swelling it seems like it would be safe to conclude that you’re not going to make anything worse as long as your pain level is not increasing. If you then increased to running two or 3 miles every other day and you don’t have any increase in pain, you don’t have any bruising or swelling I wouldn’t be concerned that the risk of re-injury is increasing. Let’s say you run every other day and you keep tracking your pain level during the run, the evening of your run and then the morning after your run and you can clearly see a trend where that pain has increases to a 2 or 3 out of 10 and it’s lasting for five minutes every morning. Then after a few days you notice when you start walking the pain seems to be lasting for an hour every morning. A couple of days later you notice the pain seems to be lasting for two hours and the pain level had increased to a 5 out of 10. This is clearly a trend that is going the wrong direction. In my mind the goal is always to ramp up the activity as much as possible and as quickly as possible so that you can maintain as much fitness as possible while not doing any damage and while allowing the healing to persist. You want the healing to continue. 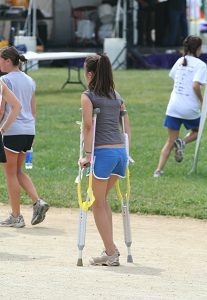 You want to make sure that the stress fracture, or whatever injury you might have, is resolving. You want to make sure that it will continue to get stronger and more stable. You just need to make sure that you stay within your threshold for recovery and not cross over that line and develop a re-injury or the equivalent of another over-training injury. You can really only monitor that with 3 things: pain, bruising and swelling. If you keep a pain journal and you’re sure that you have no bruising or swelling and all you have is pain, And pain is all you have to go by. So in that case, I would start deliberately ramping up activity while being cautious and remembering that stress is the overall thing that you’re trying to modify. And you have to remember that you’re trying to modify the amount of global stress. Not just the amount of stress to the specific injured metatarsal from gravity. It’s not just the pounding to the bone it’s over all stress that matters. Remember it’s called a “stress fracture.” All forms of stress can contribute to a stress fracture. Sure, pounding your feet incessantly with 50 mile runs is an obvious high-level of stress. But so taking on a new level of responsibility at work is stressful. Sleep deprivation is stressful. So is nutritional stress like a poor diet because you’re traveling. All forms of stress can inhibit healing and help to contribute to pushing you over the edge and getting an over training injury. This is particularly true when you’re recovering after you have healed or are currently healing from an over training injury like a stress fracture. You want to think about reducing the global amount of stress during a 24 hour period. Most of the stress do your foot is going to be during your run. If you run in fairly stable or cushy shoes, whichever the case may be that you need for your particulate foot type and running biomechanics, and you’re running on fairly flat ground and you’re running at a reasonable pace and you’re trying to run with the best possible form that you can give your level of fitness, you remove a lot of variables. In contrast if you’re running fast on uneven trails in unsupportive shoes then you may be asking for trouble. In my mind the goal should be to maintain this progressive increase of mileage. You want to stick to a reasonable pace, reasonable distances, reasonable surfaces and reasonable shoes. 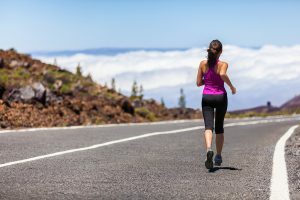 If you’re cautious and deliberate and nothing changes other than the distance can you have a way to see if your pain is really increasing in response to your mileage. So then if you’re sure that you’ve been maintaining a 1.5 out of 10 pain level every morning when you wake up in the same spot while walking on the hardwood floors going to the bathroom or something and you have a 1.5 out of 10 pain level, but it doesn’t last for very long and it doesn’t really even seem to be an essay a spot where you had tenderness when he developed the initial injury, then it probably doesn’t matter. In my mind if the pains not getting worse it’s unlikely that the injuries going to get worse. If you’re taking pain medication or you’re taking ibuprofen to mask the pain then this whole process doesn’t work. Most athletes however are not going to be taking anti-inflammatories or pain medication just try get rid of the pain and train in spite of the pain. Most runners are trying to pay attention to their bodies and level of discomfort when I get back to activity. So in most cases with a very low level of pain I would still continue to ramp up the mileage as long as the pain level continued to remain stable. Having said that, every runner has to understand that any time there is pain there is reason for concern. Your task is to figure out what is causing the pain and how concerning that pain may actually be. If you have chest pain and you’re on the run course of an Ironman, you could be worried that you are having a heart attack. Somebody might have kicked you in the swim. Maybe you swam too hard and you pulled in intercostal muscle. Who knows? But there is reason for concern if you have chest pain. An internal medicine doctor would probably be extremely concerned if you had chest pain. Now you have this tiny level of pain. The pain is intermittent. The pain doesn’t seem to be related to activity, so the pain could be from scar tissue breaking up or nerve regeneration. You can certainly get scar tissue forming after you have a stress fracture. In fact anytime you have any form of tissue damage you’re going to get some amount of scar tissue. Particularly if you been in a cast or if you’ve used crutches. When you start to break up that scar tissue you will get little twinges of pain here and there. The normal process of soft tissue remodeling of scar tissue that goes on for months after “healing” can result in these weird little intermittent sharp pains. It’s mainly the progression that you have to pay attention to and that is what really matters. If you’re getting weaker or you’re getting more and more pain, those are bad signs. If you don’t have those things and your activity is increasing, well they’re correlated. So somebody who has a standard over training injury like a metatarsal stress fracture and they start to ramp up their activity, if they’re making the stress fracture worse by doing that activity, in most cases, the pain is going to ramp up at a similar rate as the activity ramps up. If you go from running 1 mile, to 3 miles, to 5 miles, every other day, even if you make that jump rapidly, and you don’t have any increase in pain then it seems like that would suggest the metatarsal is sufficiently healed and stable enough to take that amount of stress. Now, you have to be cautious to make sure that you don’t exceed your body’s strength after an injury. Because any metatarsal stress fracture that is healing or “healed” is most likely weaker than an uninjured metatarsal. It takes the better part of a year for the full remodeling of the metatarsal to rebuild its full strength. That’s part of the reason you need to ramp up slowly and deliberately. You particularly want to make sure that you’re working on form, building your aerobic fitness, building your core fitness and building all of the other aspects of your running fitness that can help support that injured structure. All of those things that can contribute to supporting that one injured metatarsal so that it doesn’t develop another stress fracture just because your form is terrible and you’re weak and putting too much stress on it when you start running again. What about shoes and shoe inserts to decrease stress? The biggest consideration, again if you talk about the whole idea of decreasing the global stress, it’s just math right? If you run more, you know you increase the stress to any injured structure whether that’s metatarsal stress fracture that’s healing or anything else. If you walk more barefoot on hardwood floors during the day, all the time you’re at home, if you’re always barefoot on hard surfaces, that’s more stress. If you wear tennis shoes or running shoes or something that is more cushioned at home, you can decrease some of that stress. If you change the inserts of your shoes to something that will either cushion you more or add more stability so you don’t have abnormal forces as you pronate or supinate, those abnormal forces apply stress to that metatarsal that’s healing, that also decreases the stress. It’s just math. In my mind it’s like you really want to work the math then you’re favored. You want to take away stress from things that don’t matter to you and you want to add the stress where it matters in terms of your running and increasing your activity. So yes, shoes and inserts can make a difference. In terms of a recovering metatarsal stress fracture, the main thing is impact or mechanical stress and that happens two ways. One of them is gravity and not enough cushion. If you were to run, the worst thing would be no stability. So if you ran barefoot on hard surfaces, that’s probably really stressful. The exception to that is if you are a very well trained forefoot or midfoot striker. It wouldn’t matter as much but running barefoot, but there’s no cushion between you and the ground. If you have cushioning type shoes, they absorb more impact. So if you’re using neutral shoes that’s the maximum cushioning and it actually cushions more. If you’re foot is stable enough to tolerate neutral shoes, you get the maximum cushion and that in theory should decrease the amount of force to a healing metatarsal and allow you to run further. The opposite of that is trying to add stability shoes so that they’re maybe not as soft but you don’t move as much and it’s that moving back and forth between pronation and supination that can send all of your force out to one particular metatarsal and lead to a re-injury. It is a tricky thing to consider. Many podiatrist will recommend custom orthotics. Well custom orthotics so like mine are definitely not the most expensive around. In fact mine are not even as expensive as the national average. But the custom orthotics I make are still $487.00. They’re expensive because we have to make them. I have to cast you. We have to send it out to the lab, they make a mold basically a reproduction of your foot, mold your orthotic on there and then I bring them back and fit them to you. Of course most runners don’t really think that is really expensive relative to the events and races they sign up for. Let’s face it, I mean $487 sounds like a lot of money, but the pedals on my bike costs more than that. An Ironman entry fee costs a whole lot more than that. You can’t even register for a Half Ironman for that. It’s not just the cost, it’s that custom orthotics actually alter the way you run. So if you’re not used to running with custom orthotics you can feel different but basically the bottom line is like in the simplest sense when we put you in custom orthotics we’re altering the ground underneath you. We make sure that we change that your foot hits the ground. Custom orthotics can functionally modify your running biomechanics. That can help some runners. It can help but if you have a metatarsal stress fracture because we spread the forces out more evenly across the bottom of your foot. We can also remove material under the metatarsal that’s been injured so it actually has less pressure and less stress on the metatarsal when you land. So we use a custom orthotics to hold your foot in this position and then correct for any of what we perceive as deficiency in your biomechanics or sort of errors in the way you’re foot hits the ground compared to what we think normal biomechanics are supposed to be and by doing so we can also offload and decrease mechanical stress with custom orthotics. So they can help. But the real trick is to figure out if custom orthotics are really and truly necessary for you. The way I look at it is, If you’re a lifelong athlete, if I think “okay if this is somebody that’s been like running for many years somebody who has run a bunch of marathons, runs long all the time, goes and competes in an Ironman periodically” and if you’ve been doing that for many years and then you suddenly…get one injury. Does that mean you really have faulty biomechanics? Because in my mind if you really have faulty biomechanics you’re probably going to be chronically injured through the entire history of racing and training. When we hear that somebody has had chronic injuries then as a podiatrist we usually think okay like how can we adjust the feet so that that doesn’t happen anymore. It’s kind of the opposite with what chiropractors do. A lot of chiropractors will look at you and think okay well you’re compensating with your lower extremities because your back is off. If we can make your back straight, you won’t be compensating anymore and you won’t have these lower extremity injuries. It may be. So if you try custom orthotics and it changes the way that your foot is hitting the ground and it decreases some of these forces and spreads forces out more evenly in a more appropriate way for you, then it could theoretically decrease your risk of injury. In that way obviously custom orthotics could help you ramp up without further injury at the metatarsals. Most podiatrists who make custom orthotics after a metatarsal stress fracture will obviously try to take into account any flat foot deformity, any over-pronation issues, all of those things. But most deliberately they will aim to protect and offload that specific metatarsal fracture so that it can heal without so much stress as you ramp up your training. But the take-home message here isn’t that you need some magical insert. You don’t need some particular kind of shoes. 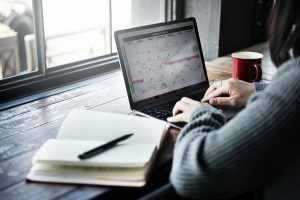 You just need a deliberate approach that allows you to assess and analyze your pain level and determine whether or not you are safely (or dangerously) ramping up your activity. Your body will give you an indication of whether or not your activity is too much. The first indication is pain. Pain is your primary signal that something is wrong. If the pain is getting worse with your activity, or some combination of the stressors that you’re applying to that injured structured, pain feels you that is just too much. If the pain continues and you also start getting swelling that’s an even worse sign. That means that you’re developing inflammation. The very worst sign is bruising. If you see any bruising you’re having tissue damage that is so significant you are bleeding under the skin. Pay close attention to the signals from your body. Control the stressors that you can control so that you only have one variable to modify…the distance that you run. Do everything you can to strengthen all of the supporting players around that one injured structure. And then carefully and deliberately ramp up your mileage with only the miles is the variable you can control. Be methodical so you can maintain your fitness and get back to running long distances as fast as possible. «« Which running surface is the hardest on your feet?